Last night we began to reap the harvest of the seeds that you and your team from Holy Child planted when you came to the deanery of Yuscaran to present the workshop “The Man in the Mirror”. 150+ men from all over the deanery came to Ojo to celebrate God’s presence in their lives. Every village/mission was represented. They came in by bus, cars, trucks, motorcycles and of course — by foot. Counting the women, there were actually about 200 people present — truly standing room only!!!! We even had children sitting on the steps leading to the Lord’s Table !!!! The scripture was the Prodigal Son and we had a professor from Yuscaran/Lainez give testimony of his walk with the Lord. All eyes were on him as they listened intently — even the children. Carlos+ gave a stirring call to evangelism and the ladies of Ojo sang the hymn “Hombres” to the men. 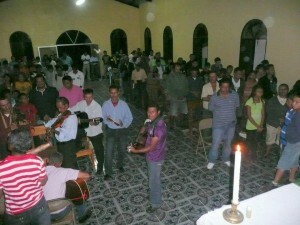 We began at 6 pm and after many songs of praise followed with food prepared by the ladies, the evening ended at 9:30 pm. The grace of God and the presence of the Holy Spirit was very evident throughout the night. Dagoberto+ was all smiles and told me to tell you how thankful he is for the spark that your group ignited here in the deanery of Yuscaran. We are praying that it will continue and spread. Please spread the good news and our thanks to the rest of your team.